Discover a variety of Maui condos for rent located in the quaint harbor village of Maalaea, the most central location in Maui. With ocean and beachfront properties available you are bound to have a breathtaking view to wake up to every day! Along with a plethora of amenities, your upcoming vacation will be equipped with all you need to relax and escape the 'real world'. Maui is a great place to go on vacation with your family and friends, and we want to make your stay here as relaxing and stress-free as possible. 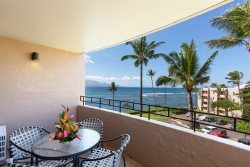 Check out our available Maui vacation condo rentals below and book online today!